With each serving enjoy a large grain-free almond flour muffin made in 90 seconds in your favorite microwave-safe mug or make two muffins in your conventional oven! (Five servings per container.) 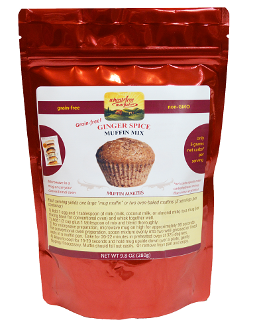 Our Ginger Spice muffin is made with clean ingredients and also quite delicious slathered in butter or cream cheese. Be sure to check out the nutrition information for net carbs, as this one boasts just 5 net carb grams! Unlike its wheaty counterparts, just one is quite satiating and each bag makes 5 large mug muffins or 10 muffins using a conventional muffin pan. Easy instructions allow you to make just one or as many as you like. Each of our Muffin Makers can be made in a conventional oven as well. Just spoon the batter into two wells in a greased muffin pan and bake for 20-22 minutes at 325 degrees. When mixing in a mug, use a small spatula and be sure to work the sides and bottom of the mug. You can also make Muffin Makers in a small soup bowl in the microwave. It makes a nice little domed "cake." Almond Flour, Erythritol, Psyllium Husk Powder, Cinnamon, Nutmeg, Ginger, Pink Himalayan Salt, Cream of Tartar, Baking Soda, Cloves, Vanilla Bean Powder.